“Apple has placed a hiring freeze on the team responsible for the company’s nascent automotive ambitions after executives became unhappy with the project’s direction and progress,” Sam Oliver reports for AppleInsider. MacDailyNews Take: Is this just a pothole, a proverbial bump in the road, or a roadblock? Or could it just be that Jony is issuing a wake up call to the Project Titan troops? Day before earning, me smells a hedge fund rat! I think it probably means that any marketable product is still years away. I don’t expect to see an Apple Car keynote before 2020. The rumored goal is 2019. That’s three years ahead. A lot happens in three years. I have my own theory about why decline happens at companies…. The company does a great job, innovates and becomes a monopoly or close to it in some field, and then the quality of the product becomes less important. The company starts valuing the great salesmen, because they’re the ones who can move the needle on revenues, not the product engineers and designers. So the salespeople end up running the company…. When the sales guys run the company, the product guys don’t matter so much, and a lot of them just turn off. You should attribute that quote to its actual author: Steve Jobs. He probably actually thinks he thought of it. Or maybe he thinks we’re too stupid to know where it actually came from. Or that Apple has unaccountably become like typical corporations: protecting its cash cows at the expense of innovation and everything else, governed by visionless executives and a corpulent board of directors accountable only to avaricious shareholders, and by disparate teams huddled in silos goosing their own P/L statements and undermining the others. Well, it’s a good thing that Jony Ive is in charge then isn’t it? While this used to describe Ballmer’s tenure at Microsoft, to what company are you trying to refer to in such an unoriginal way? Right. Didn’t Jobs famously express dissatisfaction at some point about the iPhone project? Put that in Context and that’s how the iPhone became the perfect world changer it is. Too many people on too many committees were making the designs too thick, so he’s putting the brakes on to that. I guess it had too many cup holders like the car Homer designed. Just remember that Tesla and others are not making any money on electric vehicles. Additionally, the decreased oil prices are going to be in place for an extended period. Hybrids and electric only car sales will faulter when you put the additional expense and range limit issues(elec.) into the mix with time to recover expense. AppleCAR future rests in the car cabin. I want to be able to get into my car and have my iPhone screen and features bluetoothed into the car systems regardless of vehicle manufacturer…..
… And Tesla has had to two big problems show up in their recent cars during the last two months. This is life on the bleeding edge. Customers are essentially beta testers. Apple is, apparently, nowhere near alpha testing. Tesla (and Apple idc) are not selling cars into a market that is price sensitve on pump prices for gas. They are selling to those who want the latest, greenest, head turner etc. The question is whether Apple is going for a change similar to that of the iPhone vs Motorola 360 or if it is just a little bit further down the road Tesla has marked out. It’s better to get the problems solved now, while there’s still time, then wait and have a disaster later. I recently saw “The Big Short.” It made me sick to my stomach. Although I found the characters likable. These are the same kinds of guys which are betting against Apple. On the one hand in the movie, they were a great bellwether, to the housing bubble collapse. From the outside looking in, when it comes to Apple, I can’t help but think these guys are capable of cheating and lying to make the spread. As it is, we know the system is broken. We know there are both idiots and geniuses running Wall Street. I can’t wait for the day where honesty prevails, if ever. I certainly do not want things to collapse, but I am sick of the dark side of exploitation. Who can we trust? The full article mentions a possible partnership between Apple and BMW, which could be very significant development. Personally, I don’t think Apple has a snowball’s chance in Hell of designing a successful automobile without the help of a company that actually knows how to design and build cars. IDK. The Tesla roadster was based on an existing car from a well respected company (Lotus). Elon Musk is on record saying he regrets not just starting with a blank sheet of paper. It will only be a benefit to Apple if they partner with a legacy car producer that can accept how little they will bring to the table. ICE manufacturers just don’t get BEVs. They said, the lessons from “The Mythical Man Month” seem to be in play. You need just there right leader to keep all the cats headed in the same direction, and a 1000 creative anythings may have more solutions than anyone can sort out. It’s when, after progress in the project, it is analyzed whether the project has actually fulfilled the purpose of the project, which is to solve step one, identifying a problem or situation that requires attention. In this case it, apparently, is the Car. 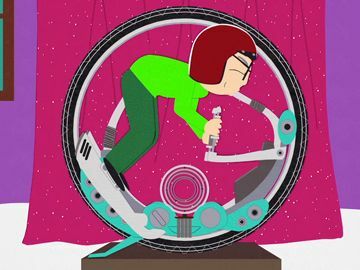 Tim Cook got the idea from Southpark. Look for a similar feature in the Apple car.